Blue Devils short sleeve Athletic T-Shirt by Gear for Sports®. Available in Soccer & Volleyball. 100% Cotton. 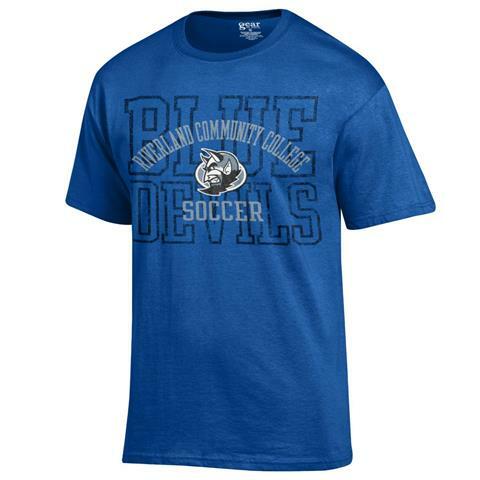 Please select option for Blue Devils Soccer & Volleyball T-shirt. Russel Athletic® printed long sleeve Riverland Basketball t-shirt. 60% Cotton, 40% Polyester. Made in El Salvador. Please select option for Long Sleeve Basketball T-Shirt from Russell®. 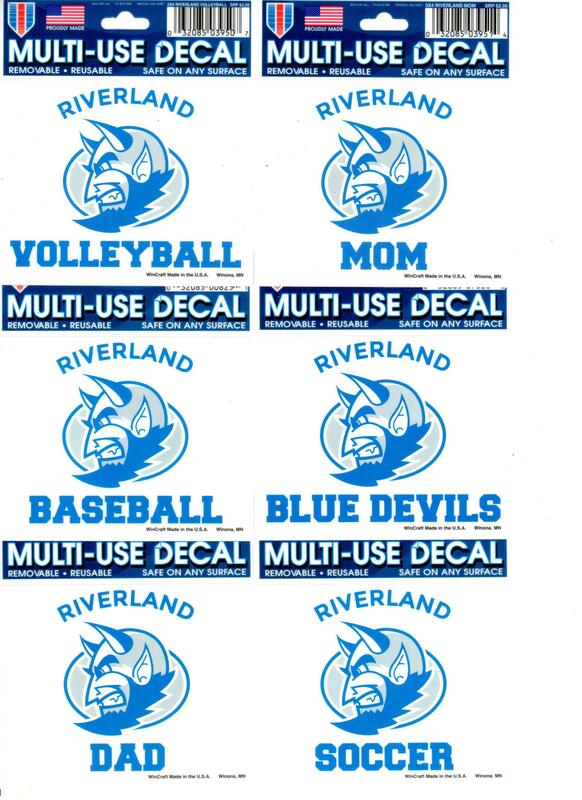 Available in Riverland Blue Devils, Baseball, Softball, Volleyball, Basketball, Mom, Dad, Soccer, or #1 Fan Ultra Decals. Please specify which decal you would prefer in the comments section of your order. This long sleeve tee from Russell Athletic® represents Riverland's Softball team. 60% Cotton, 40% Polyester. Made in El Salvador. Please select option for Riverland Softball Long Sleeve Tee. This short sleeve tee from Russell Athletics® represents our Riverland Softball team. 60% Cotton, 40% Polyester. Made in El Salvador. Please select option for Riverland Softball Short Sleeve Tee. Russell Athletic® short sleeve Riverland Baseball t-shirt. 60% Cotton, 40% Polyester. Made in El Salvador. Please select option for Short Sleeve Riverland Baseball Tee from Russell®. Russel Athletic® printed short sleeve Riverland Basketball t-shirt. 60% Cotton, 40% Polyester. Made in El Salvador. 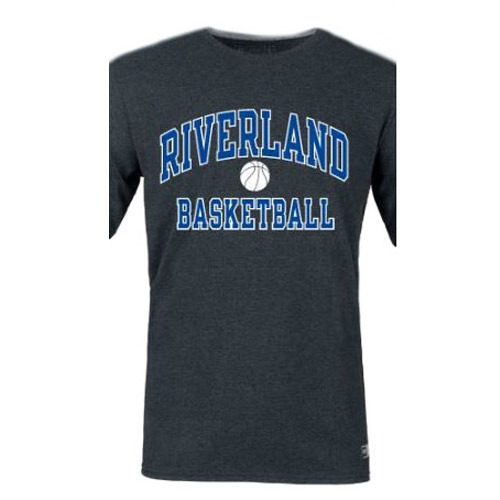 Please select option for Short Sleeve Riverland Basketball Tee from Russell®. This long sleeve tee from Russell Athletics® represents Riverland's Volleyball team. 60% Cotton, 40% Polyester. Made in El Salvador. Please select option for Volleyball Long Sleeve Tee. This short sleeve tshirt from Russell Athletics® represents our Riverland Volleyball team. 60% Cotton, 40% Polyester. Made in El Salvador. Please select option for Volleyball Short Sleeve Tee. Riverland Community College, a member of the Minnesota State system, is an equal opportunity, affirmative action educator and employer. Riverland Community College is accredited by the NCA Higher Learning Commission.